Fernbus Coach Simulator Add-ons available now as box! 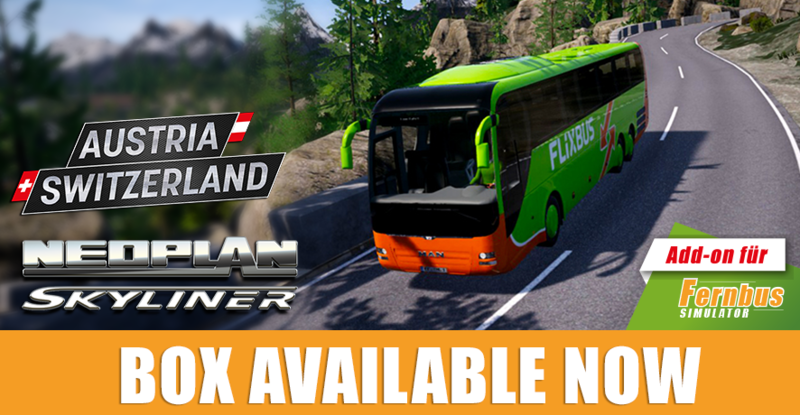 The two Fernbus Coach Simulator add-ons "Neoplan Skyliner" and "Austria/Switzerland" are now available as box versions! Our pre-order customers will be happy to hear the boxes have already been shipped and will arrive at your doorstep within the next days. Expand your journey with the popular Fernbus Coach Simulator by the Neoplan Skyliner, a luxury-class coach, and discover the impressive landscape of the alps in Austria and Switzerland. Get the popular extensions "Fernbus Simulator Add-on Neoplan Skyliner" and "Fernbus Simulator Add-on Austria/Switzerland" now also as boxes!